Stock photo of Frauenkirche, aka Domkirche zu Unserer Lieben Frau, (Cathedral of our Blessed Lady) in the City of Mnchen (Munich), Bavaria, Germany, Europe. Frauenkirche, Domkirche zu Unserer Lieben Frau, (Cathedral of our Blessed Lady) in city of Munich. This stock photo shows the Gothic style cathedral, Frauenkirche, aka Domkirche zu Unserer Lieben Frau, (Cathedral of our Blessed Lady) in the City of Mnchen (Munich), Bavaria, Germany, Europe. 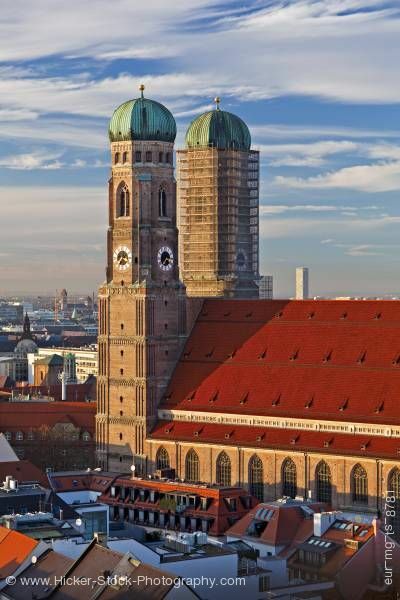 The Frauenkirche, Cathedral of our Blessed Lady, is designed in the Gothic style architecture but the domes are constructed based on the Renaissance style. This magnificent cathedral is a landmark that dominates the view in the city of Munich. The towers are identical in looks with their patina domes, arched windows, and clocks on each side of the towers. The cathedral has a peaked roof that is shingled in a deep red color. The cathedral displays beautiful stained glass windows within its red brick walls. The buildings surrounding the cathedral seem miniature to the size and display of the cathedral. Frauenkirche, aka Domkirche zu Unserer Lieben Frau, (Cathedral of our Blessed Lady) in the City of Mnchen (Munich), Bavaria, Germany, Europe.